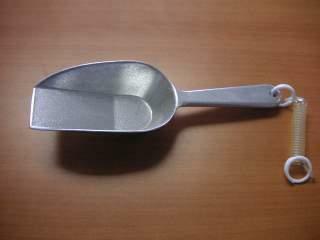 You need this 4 oz Candy Scoop w/ Tether! When you place this scoop with your candy display, you give customers an easy way to serve up their own selections. From candy to ice cream toppings to cereals, this scoop can stand up to the job. Having an event with a candy buffet? Add this scoop to the mix and guests can help themselves to all those candy treats. Your customers will dish up scoopful after scoopful of profits when you supply these convenient scoops for dispensing your products. Purchase several today at All Candy Containers. Overall Length of Scoop is 8.25"